My name is Jenn and I am wearing my twin daughters, Payton and Cecilia. They were 8 months old in this picture. 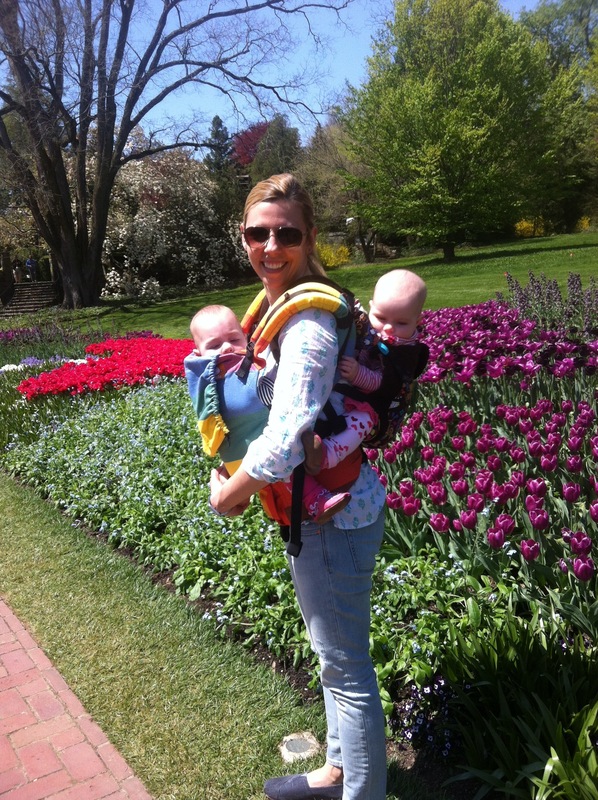 I was with my friend Barbara (also baby wearing) and her daughters, Kaitlyn and Haleigh. We were at Longwood Gardens enjoying the beautiful flowers. This picture was taken in the tulip garden. We are using 2 Tula’s in a tandem carry. The Tula on my back is the beautiful Folk Birds print and on my front is my WC EasyCare Rainbow. This was my first time doing a tandem Tula carry. We all loved it! We babywear ALL the time, but this seemed like a perfect opportunity to enjoy the beautiful scenery and snuggle with my girls. Love and cherish those beautiful girls Jenn!